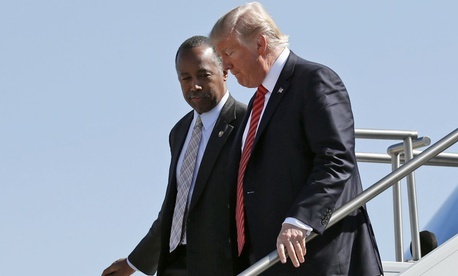 Housing and Urban Development Secretary Ben Carson did not violate the Hatch Act when he was introduced in his official capacity during an August rally for President Trump, the Office of Special Counsel has determined. Carson was introduced at the Arizona rally by a White House staffer, and did not give this staffer permission to use his official title or know of the plan ahead of time, OSC said in a Sept. 11 email to Chris Lu, the senior fellow at the Miller Center and former Obama administration official who filed the complaint about the possible violation. Further, Carson did not hear how he was introduced, and the White House employee who made the introduction no longer works there, OSC found. The content of Carson’s actual speech did not touch on his job as a Cabinet secretary. The 1939 Hatch Act allows federal officials to attend and speak at political events, but they must do so in a personal, rather than official, capacity. Carson had potentially blurred that line when he was introduced as HUD secretary and by failing to clarify he was speaking at the rally solely as a private citizen. Castro discussed both his support for Hillary Clinton and his belief that then-candidate Donald Trump was unfit for office. OSC did not recommend a punishment, instead deferring to President Obama. Kathleen Sebelius, secretary of the Health and Human Services Department in Obama’s first term, also ran afoul of the Hatch Act in 2012 when she spoke at what was initially billed as an official event but endorsed a gubernatorial candidate and Obama’s re-election.